Please contact SU at 203-249-8364 Looking forward to hearing from all our current and future students anytime. 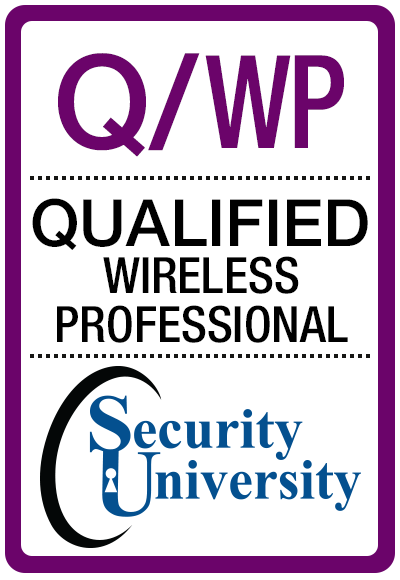 20-24 Q/CA RMF Qualified CandA Certification and Accreditation RISK MGT 4011, 4012, 4013A 4015, 4016A Approved! 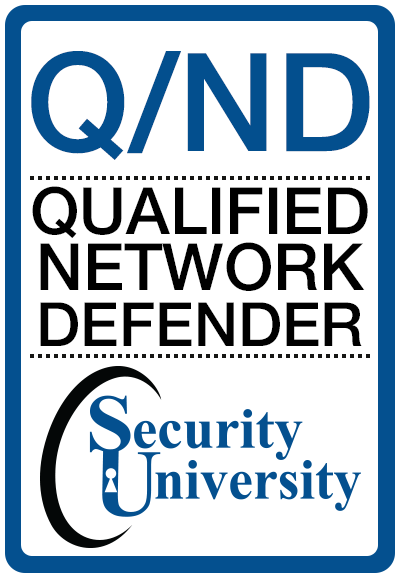 4-8 Q/CA RMF Qualified CandA Certification and Accreditation RISK MGT 4011, 4012, 4013A 4015, 4016A Approved! 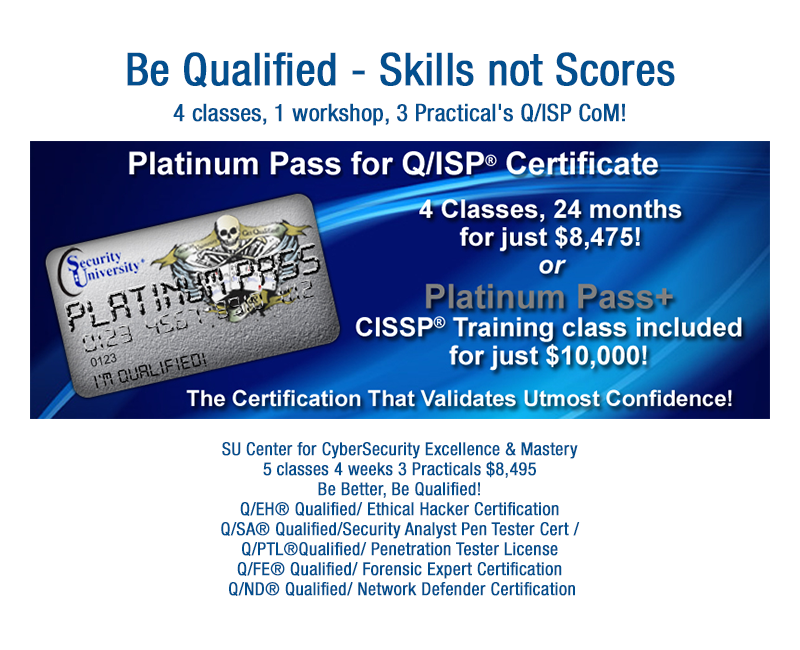 SU CASP® Certified Advance Security Prof. Cert. 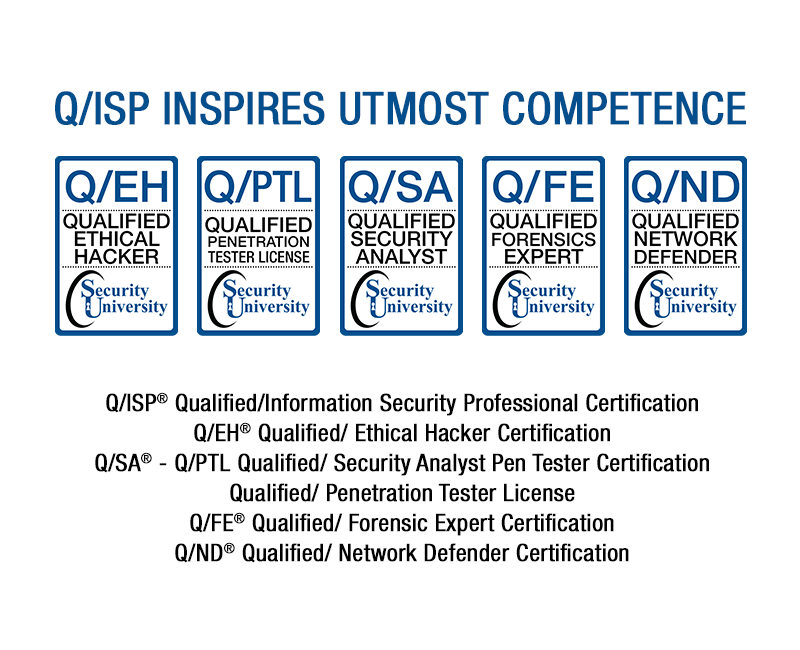 IDS I – Introduction to Intrusion Detection Cert. 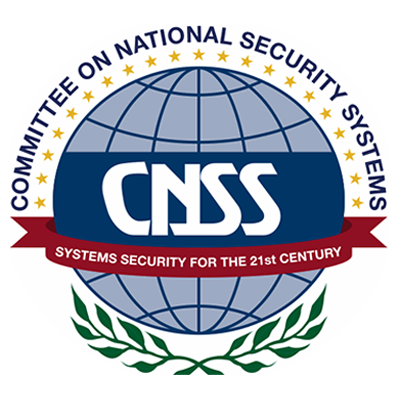 IDS II - Systems to Defend Networks Cert. IDS III: On-site Log Analysis, Event Corr. and Resp. Cert. 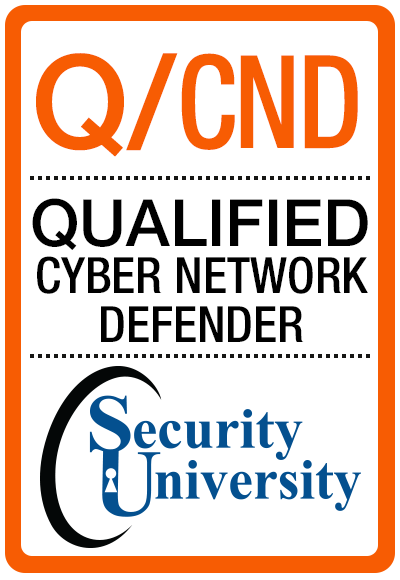 Q/CDA® Qualified/ Cyber Defense Analyst Cert. 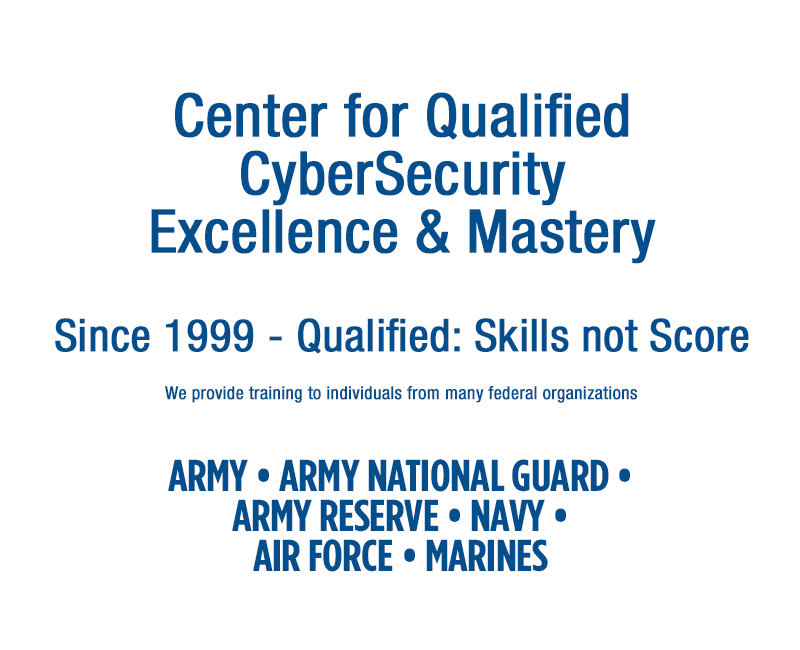 SU CompTIA CySA+ Cybersecurity Analyst+ Cert. Cloud Computing Security Knowledge Cert. 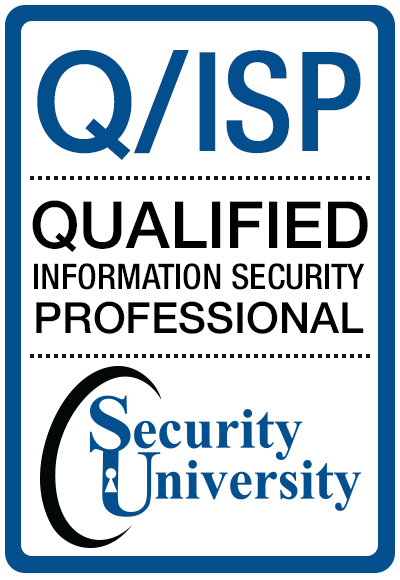 Security University's Q/ISP logo represents the highest commitment for Security professionals in the world. 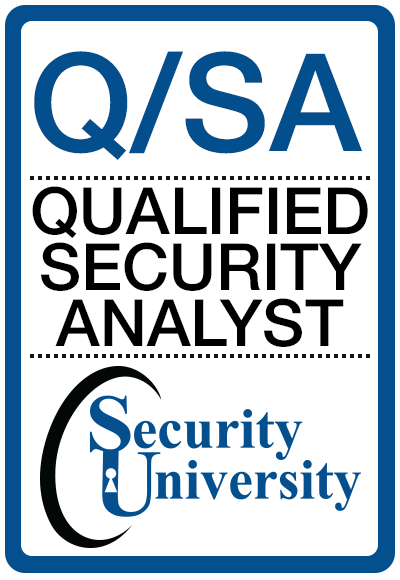 It is a custom logo created to honor security professionals who aspire to earn the most valued tactical hands-on security skills training, certifications and licenses in the world. 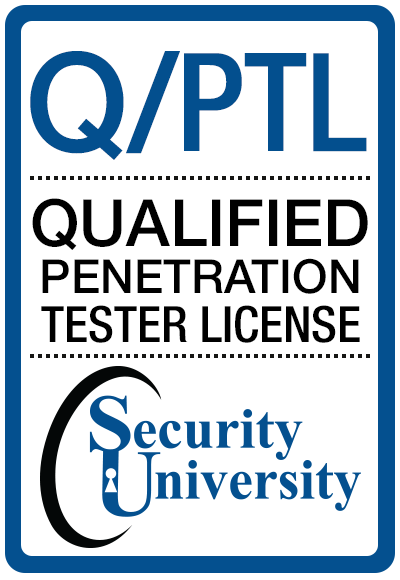 It shows you have earned "tactical hands-on security skills" and only a "certification". The skull represents brains. The ribbons symbolize integrity and honor. The wings exemplify the ability to soar towards your true potential (and above the turkeys you work with). 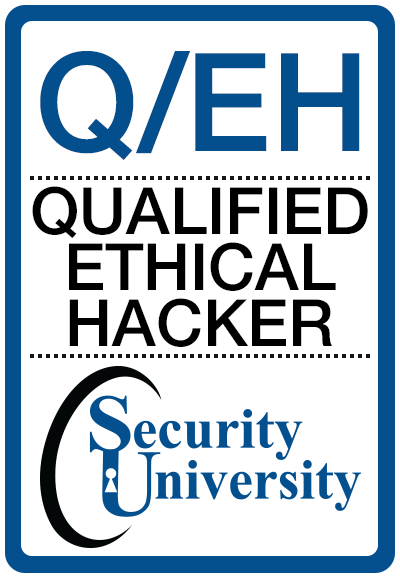 The playing cards attest that you've mastered the security skills to win at mitigating security. All SU classes are instructor led 5 day class format - unless specified in class syllabus. 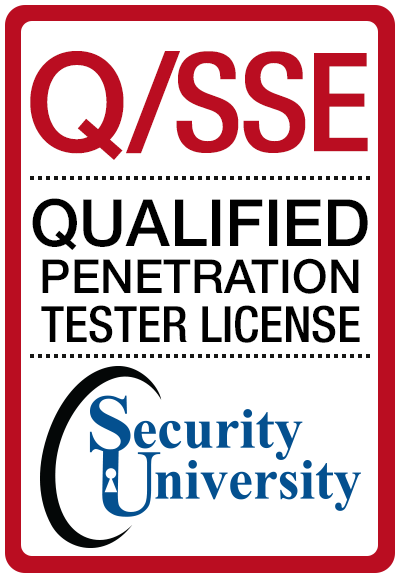 Security University Testing (SUT) Exams Q/EH®, Q/SA®, Q/FE®, & Q/ND® micro credentials are delivered by TESTRAC high-stakes on-line testing. Students enrolling in a course need to have a sufficient background to take the course. Students should understand TCP/IP. 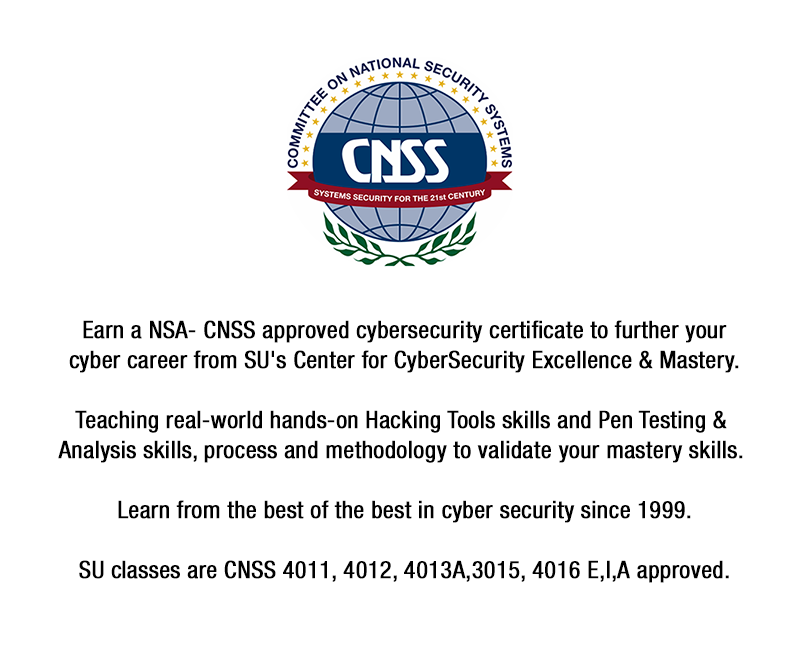 Since 1999 SU Training Courses, Certificates Programs of Mastery and their Micro Credentials validate highly qualified, hands-on performance based cyber security training for information security/ cyber professionals. SU is accredited by MSA-CESS. 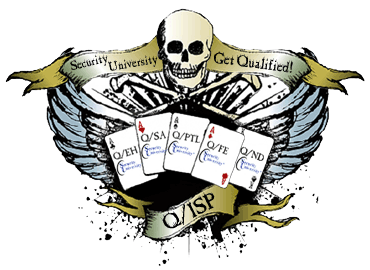 The Q/ISP Certificate Program of Mastery rigorously Qualifies & Validates CyberSecurity Professionals with hands-on tactical security skills necessary to deliver the capability to establish, operate, defend, exploit, and attack in, through, and from the cyberdomain. I’ve definitely learned more sitting through the course than from any vender in the past. Very well deliver of the course material. Definitely have gotten a good return on investment for this course. The study material that was provided helped so much to be able to make it easier to follow the course. Thank you for this opportunity and wonderful experience! I'll continue to work and build on everything I learned this week to further my career. Security University has shown me there are no limitations to new beginnings so I'll be taking full advantage of this rediscovered hope! 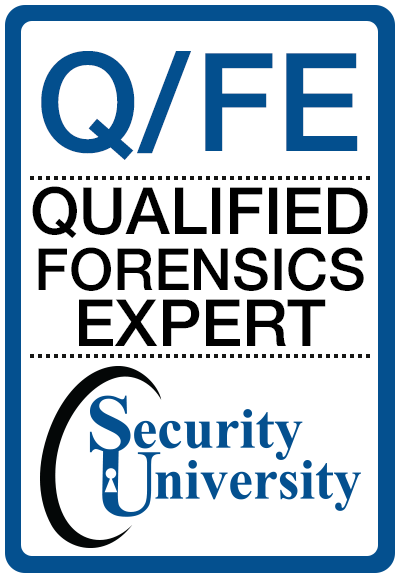 You guys ROCK I learned a better fundamental understanding of multiple security techniques/policies/and procedures. Yes, this was a highly accelerated course with a lot of content. The fast based learning will help me be more effective in my job. I learned how to apply course content to real-life scenarios. This was a highly accelerated course with a lot of content. The fast based learning will help me be more effective in my job. It was time well spent.